← Fishing About For a Good Dish? There are a few late summer dressing debates going on across the web. Will, over at A Suitable Wardrobe quite rightly points out that this is more a time to switch palettes rather than fabrics. I agree and only wish that I had more flexibility in my wardrobe to do so. 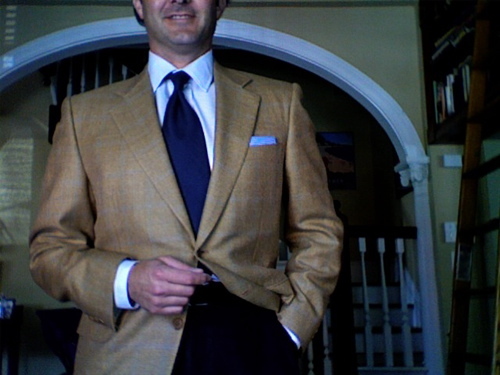 This photo shows a wool jacket (lightweight) with navy linen trousers, a light blue and tan checked shirt and a navy linen tie. Gingham pocket square. 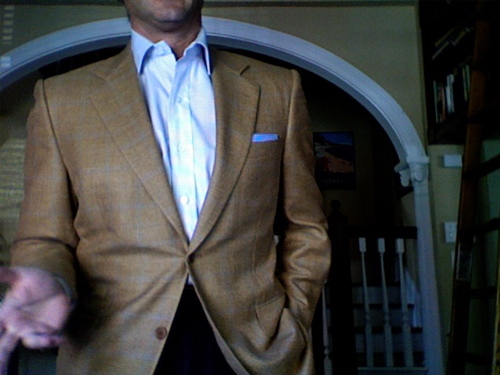 Are the tan jacket and pocket square too light for late summer dressing? At The Sartorialist there is a European vs. American debate about the suitability of wearing one’s jacket over one’s shoulders during hot weather. What’s your vote? It’s a tough look to pull off, in my opinion. I left myself unshaven and tried gesticulating more whilst soliloquizing to lend the photo more of an Italian/Mediterranean air. 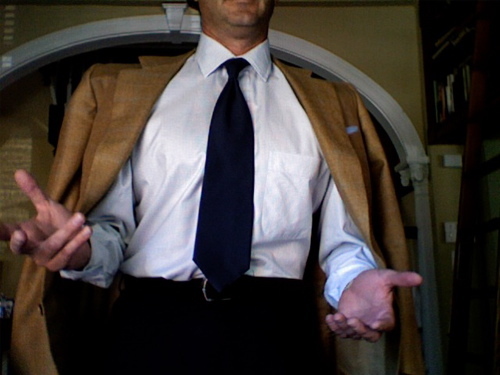 This entry was posted in Elegantology and tagged A Suitable Wardrobe, blogs, late summer dressing, The Sartorialist. Bookmark the permalink. I think the difference between photograph No. 3 and photograph No. 4 is cavernous. 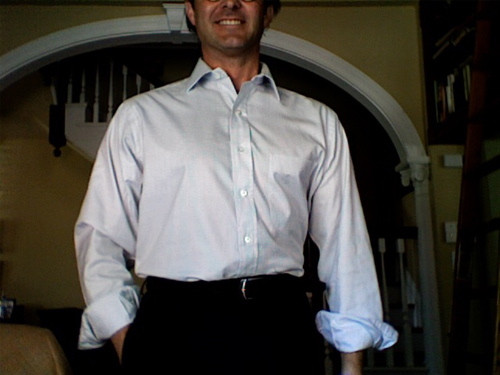 I, unlike many conservative dressers, do not find a sans-necktie look to be disastrous, especially in summer months. But look No. 4 equates you to a member of tech support at a “big-box” retailer, or a high schooler at a prom, stripping off all his nicities to dance the night away. As for look No. 2, my fiancée has a wonderful poster hanging on the wall in her childhood bedroom, titled “An American Girl in Itay,” and a date I cannot recall, though it may well be 1954. In it I suspect one might find every aspect of Italian men’s dress, complete with an older Italian gentleman (all other men in the picture are mid-30s), wearing his jacket over his shoulders. He is by far the most refined, yet he still looked at the girl striding down the street as a wold looks at a sheep in Looney Tunes. I, for one, am for the shoulders look, if you can pull it off (It seems you can, while I, regrettably, cannot). Rereading my post, I must apologize for a number of grammatical errors, and one garish spelling mistake: wold is surely not a word! I, of course, meant wolf. Also, I must say, your pocket square makes the blue in that jacket stand out beautifully!